In Win takes the wraps off its XFrame Limited Edition, an open-frame case for PC builders, hardware testers, modders and overclockers. In-Win Development Inc. has today announced its new limited edition, open-frame chassis - the XFrame. Now professional PC builders, PC modders and overclockers can truly test, benchmark and tweak, anyway they want to, anytime they need thanks to the easy, open design that allows fast, on-the-fly changes. In-Win's innovative X design shape provides both strength and rigidity, while also allowing the frame to stand vertically or sit horizontally on its non-slip rubberized feet. 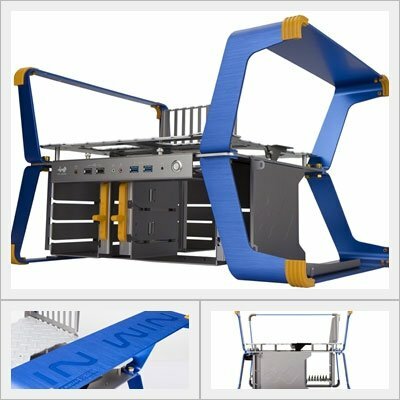 Compared to standard open-frame chassis that can only sit horizontally, this gives XFrame users an additional degree of freedom. The aluminium construction makes the XFrame exceptionally light, yet strong, while the 329 x 518 x 408mm (13 x 20.4 x 16.1inch) size means it's also exceptionally portable compared to other 8-PCI slot , ATX PC chassis. The dual-layer design has dedicated space for up to six 3.5" drives and two 5.25" drives in total, as well as up to E-ATX motherboards, full-length (12") graphics cards and ATX power supplies, while the removeable handles and front ports offer a variety of customizations depending on users needs, giving it ample upgradeability for a huge variety of PC builds. Never miss out on using the convenient motherboard pin-outs either, as the XFrame includes two USB 3.0, two USB 2.0 and HD audio front panel connectors.